under both federal and state law. 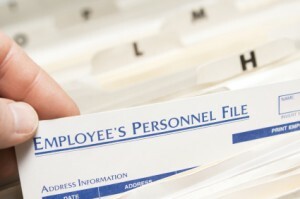 When collecting and maintaining information to be kept in employee personnel files, it is important to comply with all applicable federal and state laws, including any requirements as to what information must or should be collected, what your company may or may not do with that information, and how long employee records should be kept. Medical/insurance records (medical questionnaires, benefit enrollment forms and benefit claims, doctors notes, accommodation requests, and leave of absence records). Investigation records (although relevant disciplinary action, counseling or other direct communications are placed in the employee’s personnel file). Finally, some records, such as Form I-9 audits, are maintained in common files where they are easily accessible for specific purposes. Maintaining records in separate files as discussed above allows managers, employees and outside auditors to see the information they need to make decisions, yet does not allow inappropriate access. Next Next post: Overtime Rule Blocked!